Ad agency J. Walter Thompson created a London billboard for Kit Kat, as famous for their chocolate-covered wafer bars as for their ad slogan “Break me off a piece of that Kit Kat bar!” In keeping with Kit Kat’s break theme, JWT designed the billboard to take a time out, in honor of Earth Hour, by switching off for 60 minutes to serve as a reminder for people to reduce their energy consumption. 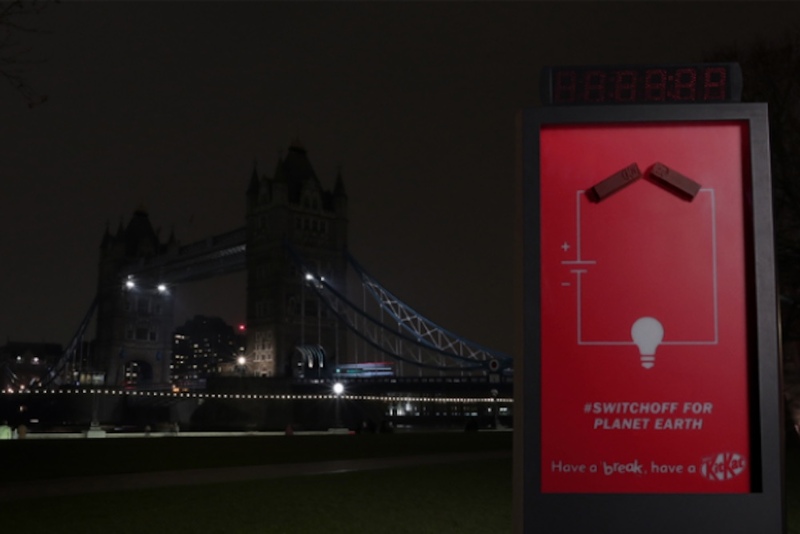 The billboard was positioned next to London’s Tower Bridge, which also extinguished its lights at 8:30 pm on March 24, in keeping with the trending #SwitchOff For Planet Earth twitter hashtag. It was a creative way for Kit Kat to align its brand with an environmental cause.